Examining how students’ epistemic beliefs (EB) influence their cognition is central to EB research. Recently, the relation between students’ EB and their motivation has gained attention. In the present study, we investigate the development of the relationship between students’ EB and their achievement goals (AG) over grades 5–11. Previous studies on this topic are limited, in both number and range, and have produced inconsistent results. We performed a cross-sectional study, ranging over grades 5–11, and a 3-year longitudinal study (n = 1230 and 323, respectively). Data on students’ EB and AG were collected via questionnaires. Confirmatory factor analysis (CFA) supported a two-factor goal model (Mastery and Performance goals) and a structure of students’ EB comprising Certainty, Source, Development, and Justification. For each grade, students’ CFA scores on the respective goals were regressed on their scores on the EB dimensions by orthogonal projection to latent structures analysis. Although results indicated a weak relation between students’ EB and AG, trends in the cross-sectional data were largely replicated in the longitudinal study. Though naïve EB were in general associated with performance goals and sophisticated EB with mastery goals, the transition to upper secondary school was associated with changes in the relationship between students’ EB and AG. We discuss how the commonly used formulations of EB items may affect their ability to measure the naïve-sophisticated continuum, in turn affecting the predictive roles of EB dimensions. Many educational systems stress the need to help students develop their beliefs about knowledge and knowing, that is, their epistemic beliefs (EB), that in turn are supposed to generate productive approaches to learning (Elby et al. 2016). Recently, increased attention has been aimed at a broadened perspective on the process of thinking about knowledge and knowing, in other words epistemic cognition, incorporating motivation, metacognition, and conceptual change (Sinatra 2016). In this strand of research, exploration of the relation between students’ EB and their motivation for engaging in thinking about knowledge is central (Chinn et al. 2014). This was also pinpointed by Sinatra (2016), who claimed that “One of the most intriguing aspects of epistemic cognition is exploring how thinking about knowledge influences and is influenced by other constructs, such as motivation and emotion” (p. 486). Given the intentional and goal-directed nature of epistemic cognition, Chinn and Rinehart (2016) suggested a link between EB and achievement goals (AG), that is, the goals students have for their engagement in learning. For example, students with sophisticated EB about the source of knowledge are likely to hold mastery goals, that is, desire to learn for the sake of learning, and therefore take a more active role in learning (DeBacker and Crowson 2006). In contrast, students who believe that their primary role is to remember what the teacher says may be less prone to process actively that information to create their own understanding of the content. This far, not much has been done to investigate the nature and degree of association between EB and AG (Murphy et al. 2010) and the few existing studies show inconsistent results. Furthermore, most studies have been cross-sectional (Chen and Barger 2016); hence, very little is known about how the association between EB and AG develops over time. In our study, we have examined the nature and strength of the association between students’ EB and AG in a cross-sectional and a longitudinal study. Our hope is that this will shed some light on inconsistencies regarding the relationship between students’ AG and their EB’ sophistication level in earlier research and contribute to the knowledge about the dynamics of this relationship during the course of education. Our aim is to deepen the knowledge of how the relationship between students’ EB and AG develops over time. More specifically, we investigate the relative importance of the EB dimensions for predicting AG in grade 5 through 11, in both a cross-sectional and a longitudinal study. EB research focus on how people come to know and how they use their conceptions about knowledge and knowing to understand their surroundings (Hofer and Pintrich 2002). EB research and theories are prominent in educational and psychological research and the research field has developed rapidly over the last years. Yet, the conceptualization of EB has been subject of debate. A variety of terminologies and methodologies have emerged to understand the nature of EB (e.g., Hofer and Pintrich 1997; Chinn et al. 2011; Muis and Franco 2009). Despite the lack of agreed-upon operationalization of EB, a growing consensus define and adopt the construct of EB as multidimensional, multilayered, and contextual in its nature (Hofer 2016). That is, one’s EB system comprises multiple independent dimensions and may vary due to different levels of context specificity (Schommer 1990; Bråten and Strømsø 2010; Muis et al. 2006). Each of these dimensions is construed as depicting a naïve-sophisticated continuum similar to the dualist-relativist continuum described by Perry (1970). Moreover, EB are conceived as context-sensitive and are influenced by the nature of the learning context (Muis et al. 2016). In the same vein, Greene et al. (2016) recommend domain-specific approaches, as there is evidence that EB may differ across disciplines and are not necessarily transferrable from one domain to another. Therefore, in this study, we chose to narrow our focus to consider students’ EB in the science domain. In the science domain, researchers have conceptualized EB as made up of four core dimensions (Conley et al. 2004; Chen 2012), namely, source of knowledge, justification for knowing, development of knowledge, and certainty of knowledge. Beliefs about source of knowledge concern the origin of knowledge, ranging from beliefs that knowledge comes from authorities (naïve) to beliefs that the individual herself constructs knowledge (sophisticated). The justification for knowing dimension refers to how individuals use and justify knowledge. A sophisticated stance in this case would be to consider that claims need to be justified by evidence. In contrast, naïve beliefs would equal knowledge with opinions, not needing evidence to be justified. Development of knowledge indicates beliefs about knowledge as either fixed (naïve) or changeable (sophisticated) over time. Certainty of knowledge concerns individuals’ beliefs in a single correct answer (naïve) or beliefs that more than one answer may be correct (sophisticated). It has been shown that while more general EB seems to be relatively stable, students’ domain-related EB are highly influenced by the practices and norms of the classroom (Greene et al. 2016; Kelly 2016; Muis et al. 2016) and may shift over time to align with the character of the learning environment (Duffy et al. 2016). Research has shown that EB influence several cognitive and metacognitive processes during learning (Greene et al. 2016). Particularly, it has been found that EB are associated with learning strategies (Lin et al. 2012; Bromme et al. 2008), conceptual learning (Mason 2010), and motivational constructs such as intrinsic value and self-efficacy (Lin et al. 2013). Research on students’ EB might increase our understanding of how and why they engage in learning activities differently. More specifically, researchers have started to study issues related to motivation by exploring the reasons why individuals initially would want to be engaged in thinking about knowledge and knowing (Chinn et al. 2014). This type of research has begun to acknowledge that thinking about knowledge and knowing involves affective and motivational components. Among motivation theories, achievement goal theory has been one of the most influential in educational research the last decades (Pintrich 2003; Wirthwein et al. 2013). In this paper, we adopt Hulleman et al. (2010) definition of an AG as “a future-focused cognitive representation that guides behavior to a competence-related end state that the individual is committed to either approach or avoid” (p. 423). Though different goal models have been proposed, they generally include a distinction between mastery goals and performance goals, a distinction based on differences in how individuals define and validate competence. Students adopting performance goals evaluate competence normatively, guiding their behavior towards demonstration and validation of competence in relation to others. Students adopting mastery goals evaluate competence by absolute or intrapersonal standards and therefore seek to learn as much as possible, understand the subject, master tasks, and improve themselves (Elliot and McGregor 2001; Ames 1992). Consequently, mastery goals are related to positive outcomes, for example, interest (Church et al. 2001), use of productive learning strategies (Wolters 2004), positive emotions (Winberg et al. 2014), and high effort (Wolters 2004). Performance goals show more complex patterns of outcomes, with both positive and negative effects (for a review, see Harackiewicz et al. 1998). In addition, there is evidence that the instrumental value of performance goals change over the course of schooling. An increased endorsement of performance goals over the school years has been observed (e.g., Bong 2009). Midgley et al. (2001) proposed that this increase could be explained by an increasingly performance-oriented learning environment, paralleled by teaching and assessment practices based on “facts and right answers” (p. 83). In such an environment, performance goals would be more adaptive—hence the increased endorsement of these goals by the students. The mixed outcomes of performance goals led Elliot and colleagues to extend AG theory by reintroducing an approach and avoidance distinction for performance goals (see, e.g., Elliot and Harackiewicz 1996; Elliot and Church 1997; Elliot 1999). The difference between an approach goal and an avoidance goal lies in the valence of the goals: seeing the chance of success and approaching it, or seeing the risk of failure and avoiding it (Elliot and Harackiewicz 1996). The introduction of this second distinction led to a three-goal model with mastery (considered an approach goal), performance-approach (PAp), and performance-avoidance (PAv) goals. Despite empirical support for the three-goal model, correlations between PAp and PAv goals are remarkably high in many studies (Linnenbrink-Garcia et al. 2012). Moreover, researchers have used different conceptualizations of performance goals, which has contributed not only to the ambiguity regarding the adaptive value of performance goals, but also to differences in PAp/PAv correlations between studies (Hulleman et al. 2010). The difference in conceptualization pertains to whether the appearance subcomponent (focusing on the student’s need to demonstrate competence), or the normative subcomponent (focusing on the students tendency to evaluate their competence relative to others), or both, should be used for measuring performance goals. Research using the three-goal model has used both the normative and appearance subcomponents, either separately or together (Elliot and Hulleman 2017). Although this surely has contributed to the mixed results of PAp, Senko and Tropiano (2016) argued that neither approach is clearly superior on theoretical grounds and that studying them together could be a fruitful approach, capitalizing on their respective strengths. The data in the present paper were collected within a larger cross-national comparative study, where differences in student’s views on self-promoting behaviors, and hence, the social desirability of appearing competent, were expected between the investigated countries. Therefore, we considered both the appearance and normative subcomponent of performance goals to be relevant for our measurements. Furthermore, in Sweden, previous studies have failed to separate PAp and PAv goals, using different instruments, samples, and methods for dimensionality analysis (Blomgren 2016; Winberg et al. 2014). Hofverberg and Winberg (2018), using the same data as the present paper, consequently suggested a two-goal model, comprising a mastery and a combined PAp/PAv goal, as most appropriate for Swedish students’ AG. The present paper follows that suggestion. This is in line with several other studies examining the relationship between EB and AG (e.g., Ricco et al. 2010; Kizilgunes et al. 2009). According to Chen and Barger (2016), future educational research needs knowledge about the intersection between EB and AG. With this knowledge, future research can advise educators in how to create environments and activities that motivate students to develop more adequate ways of dealing with knowledge and knowing. EB have been suggested to act as antecedents of AG by creating tendencies for adoption of certain goals (Hofer and Pintrich 1997). DeBacker and Crowson (2006) proposed that students with theoretically sophisticated beliefs, for example, believing that the source of knowledge is internal rather than external, are more likely to value deep learning and task mastery, thus adopting mastery goals. In contrast, students believing in omniscient authorities are more likely to have an outward focus and thus adopt performance goals. Despite high interest in AG and EB separately, and the theoretical linkage described above, there is a limited number of studies on the association between EB and AG (Murphy et al. 2010). Among studies that do investigate the association, several support the proposed model, with sophisticated beliefs correlating with mastery goals and naïve beliefs correlating with performance goals. For example, in Bråten and Strømsø (2004), mastery goals were negatively correlated with naïve beliefs about speed of knowledge acquisition and construction/modification of knowledge, whereas PAv were positively correlated with these naïve EB and PAp mostly uncorrelated. Similarly, DeBacker and Crowson (2006) showed that naïve beliefs about simplicity, certainty, and authority collapsed into one “index of naïve beliefs” were positively correlated with PAv, but negatively with mastery goals. The results of Muis and Foy (2010) point to a positive correlation between performance goals and beliefs about knowledge as simple and certain, but a negative correlation between mastery goals and the same beliefs. More recently, Abedalaziz et al. (2015) corroborated this pattern. However, other studies indicate that mastery and performance goals correlate in similar ways with EB. In Kizilgunes et al. (2009), both mastery and performance goals correlated positively with naïve beliefs about the source of knowledge and with sophisticated beliefs about the development of knowledge, but negatively with naïve beliefs about the certainty of knowledge. In Mason et al. (2013), both mastery and PAp goals correlated positively with sophisticated beliefs about justification of knowledge, though only mastery goals were significantly correlated with development. In Ricco et al. (2010), both mastery and performance goals were positively correlated with sophisticated beliefs about the justification of knowledge and naïve beliefs about certainty of knowledge and reliance on authority. Also, both mastery and performance goals were negatively correlated with beliefs about knowledge as privileged. As there is no discernable pattern for how naïve and sophisticated EB correlate with AGs in these studies, the results contradict the theoretical association between EB and AG proposed by DeBacker and Crowson (2006) and Hofer and Pintrich (1997). In conclusion, though there seems to be an association between EB and AG, previous results are inconsistent concerning the exact nature of the association, and more research on the subject is warranted (Murphy et al. 2010). A plausible explanation for these inconsistencies is that there are variations in the association during the course of schooling. However, the research on the development of the association between EB and AG over time is particularly scarce, especially longitudinal studies. To our knowledge, the study by Bråten and Strømsø (2004) is the only longitudinal study of the association between EB and AG. This study, following teacher students for 1 year, showed that EB were stable whereas AG were more fluctuant. In addition, beliefs about the speed of knowledge acquisition at time point one were significant predictors of AG at time point two. However, similarities and differences in the association at time point one and time point two, that is, the development of the association, were not explored further, hence further research on this issue is warranted. Several other studies have included students from different grades in cross-sectional designs, but most of these studies combined the different grades into a single sample in the analyses (see, e.g., Chen 2012; Madjar et al. 2017; Ricco et al. 2010). Two cross-sectional studies that analyzed different grades individually, Mason et al. (2013; grades 5, 8, and 11) and Murphy et al. (2010; grades 8 and 9), revealed similar correlations between EB and AG at each measurement point. Hence, previous studies indicate that the association between EB and AG is stable. Despite the contribution these studies have made regarding the development of the association between EB and AG, the number of empirical studies is low. We believe more longitudinal studies would be valuable to deepen the knowledge about this development. Thus, to study the interplay between EB and AG, we intend to investigate it as a cross-section over a large span of grades, but also to follow groups of students longitudinally over three measurement points, in total 2 years. The present study concerned Swedish students from grades 5–11, and was focused on the chemistry subject. In the Swedish compulsory school, transitions between different levels of schooling occur at the beginning of grades 7 and 10, respectively. Normally, students are mixed into new classes, often at a new school, at both these transitions. At the primary level (grades 5 and 6 in our sample), students often have the same teacher for most subjects, while there are separate teachers for the different subjects at the lower and upper secondary level. This study consists of two substudies, one cross-sectional and one longitudinal. For the cross-sectional study, we invited all students in grades 5–11 in two municipalities in Sweden to respond to an online self-report questionnaire under teachers’ supervision. The questionnaire contained several instruments, assessing for example students’ interest, self-concept, and perception of classroom environment. However, only two instruments are relevant for the study reported here: one measuring students’ EB and one measuring students’ AG. After data were cleaned with respect to “careless responders” (see Meade and Craig 2012) and errors, 1230 (58% females) students remained in the sample. Their ages ranged from 11 to 17 years. For the longitudinal study, students from grade 5 (the lower cohort) and 9 (the upper cohort) in the cross-sectional study were followed over the course of three grades, to grades 7 and 11 respectively. Students missing one wave of data collection were allowed to participate in later waves. Each year, students responded on the same instruments as in the cross-sectional study. The original sample size was, after cleaning data for “careless responders” and errors, 141 (59% females) in grade 5 and 230 (54% females) in grade 9. For more details regarding survival rate, see Table 1. All questionnaire items were translated to Swedish from the original instruments. Moreover, the adapted questionnaire had been piloted with students from different grade levels to determine any items that might be misunderstood. The resulting version of the EB and AG instruments comprised 14 items assessing EB and 12 items assessing students’ AG. All items were situated in the context of chemistry. Students rated all items on a 5-point Likert-type scale, from 1 (strongly disagree) to 5 (strongly agree). See Table 2 for sample items and distribution of items on subscales. The details of the measures are described in the “Measures” section below. Screening of the data showed that the responses of some participants contained very long strings of identical answers, seemingly regardless of the polarity of the items. As this entails low validity of those answers, we cleaned the data according to the length of the strings. We defined the cutoff values for students’ maximum longest string (Meade and Craig 2012) as longest string values exceeding 1.5 times the interquartile range above the upper quartile. Additionally, we calculated histograms of longest string values to judge the appropriateness of these cutoff values (see Johnson 2005). Participants with longest string values exceeding the cutoff value were excluded from further analyses. We used a modified version of the science-related instrument by Conley et al. (2004) for measuring students’ general and school-specific EB in chemistry. We made small changes in the formulations of the existing items to highlight the chemistry context. The instrument assessed four EB dimensions: source, certainty, justification, and development. We reversed the source and certainty subscales so that higher values equaled a more sophisticated belief in the following analyses. I strive to develop a broad and deep knowledge in chemistry. My goal is to avoid being worse in chemistry than other students. Whatever the teacher says in chemistry class is true. Scientists always agree about what is true in chemistry. For good opinions in chemistry, you need evidence from many different sources. New discoveries in chemistry can change what scientists think is true. Confirmatory factor analysis (CFA) supported a four-factor structure of students’ EB, comprising the factors of Development, Justification, Certainty, and Source, over all grades in the cross-sectional study, χ2 (71, N = 1314) = 245.9, root mean square error of approximation (RMSEA) = .043, standardized root mean square residual (SRMR) = .035, comparative fit index (CFI) = .94, and Tucker-Lewis index (TLI) = .93, and in the upper cohort of the longitudinal study, χ2 (71, N = 489) = 178.0, RMSEA = .056, SRMR = .041, CFI = .94, and TLI = .92. However, Source and Certainty were collapsed into a single factor in the lower cohort, resulting in a three-factor structure comprising Development, Justification, and Source/certainty, χ2 (74, N = 500) = 152.9, RMSEA = .046, SRMR = .047, CFI = .95, and TLI = .94. After four validation rounds (N ≈ 150 per round), we ended up with 4 MAp items, 4 PAp items, and 4 PAv items, though the PAp and PAv subscales were collapsed into one general performance subscale. For a complete list of items and their origin, information about the instrument and validation, and rationale for collapsing scales, see Hofverberg and Winberg (2018). CFA models showed acceptable fit for the cross-sectional sample, χ2 (53, N = 1346) = 443.4, RMSEA = .074, SRMR = .052, CFI = .93, and TLI = .91, the lower cohort of the longitudinal sample, χ2 (53, N = 490) = 155.9, RMSEA = .063, SRMR = .046, CFI = .95, and TLI = .93, and the upper cohort of the longitudinal sample, χ2 (53, N = 480) = 152.7, RMSEA = .063, SRMR = .043, CFI = .96, and TLI = .95. We used CFA and measurement invariance testing (MI) to investigate and validate the dimensionality of students’ EB and AG in each grade. After establishing measurement invariance, students from all grades were pooled into a joint CFA model to generate student scores on the constructs that were comparable over grades. This was done for EB and AG, respectively. Students’ factor scores from the joint CFA models were used for illustrating the trends for students’ EB and AG over grades 5–11 (Figs. 1 and 2) and to calculate overall Pearson correlations between constructs (Table 3). To investigate the relationship between students’ EB systems (i.e., the internal relationships of the four constructs) and AG in grades 5–11, we conducted orthogonal projection to latent structures (OPLS; Trygg and Wold 2002) analyses, using students’ factor scores for the independent and the dependent variables (Figs. 3 and 5). The OPLS method is briefly described below. Similar to the cross-sectional study, we conducted CFA and MI on the longitudinal data to investigate comparability between grades. The sample in the following analyses consisted of students participating in at least two measurement points. Both the upper and lower cohort showed measurement invariance between the grades for both EB and AG. However, measurement invariance between the two cohorts was not supported. We also performed separate OPLS analyses of the relationship between students’ EB systems (i.e., the internal relationships of the four constructs) and AG for each grade within the two cohorts. The loadings of the EB constructs, showing their relative importance for the prediction of the students’ mastery and performance goals, were plotted in Figs. 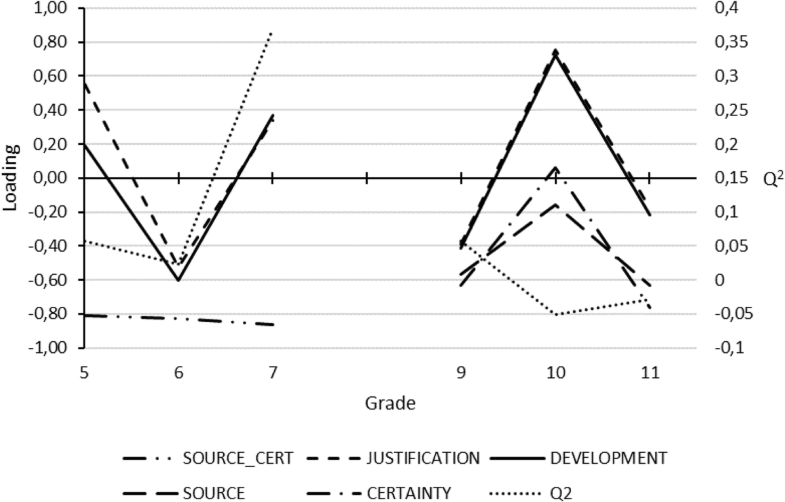 4 and 6 to show how the relationships between students’ EB and AG development of over grades 5–11. OPLS is a development of the projection to latent structure technique (PLS; Abdi 2010). Both methods are well suited for regression analysis with collinear predictor variables. In PLS, the variation in the independent variables (X) is divided into systematic variation and noise (residuals). The covariance between the systematic variation in X data and the dependent variable(s) (Y) is maximized. Because the systematic part of X data contains both variation that is predictive of Y and variation that is not (i.e., orthogonal), interpretations of the relationships between X and Y may be difficult when the orthogonal variation is substantial. OPLS differs from PLS in that orthogonal variation in the X variables is separated from the systematic variation that is predictive of Y. This improves model interpretability and predictive ability as the predictive components are not contaminated by irrelevant variation. OPLS also improves detection of outliers due to eliminated influence of orthogonal variation on the calculations of, for example, Hotelling T2 or DmodX (described below) statistics (Trygg and Wold 2002). Model fit, in terms of proportion of the variation in the variables that can be described by the model (i.e., R2) is not enough to assess the quality of a model as it increases with the number of components. Although increasing the number of components will increase the proportion of variation that is described, it will come at the cost of increased risk of overfitting, which limits interpretation and generalizability of the model. Therefore, we used cross validation (Eastment and Krzanowski 1982; Van der Voet 1994) to determine the number of significant components in the OPLS prediction models. In this procedure, one seventh of the data is systematically left out and predicted by the remaining data until all data has been left out once, and the precision of each prediction has been calculated. The precision of this prediction, for all data points, is denoted Q2. Thus, Q2 can be considered as a measure of how well the model can predict new data that are not part of the model. In OPLS, the default limits for Q2 reflect the ability of the model to predict a significant amount of the variation in outcomes, with α = .05. Components not exceeding the default Q2 limits are discarded. We performed cross-validation ANOVA (CV-ANOVA; Ståhle and Wold 1990; Eriksson et al. 2008) on all models to assess if they were able to predict a significant amount of the variation in students’ mastery and performance goals, respectively. We also performed response permutation tests to assess whether the models predicted the outcomes by chance. In this test, 100 parallel OPLS models were calculated, keeping the predictor variables intact and permutating the outcome data randomly between each model. To be considered valid, the R2 and Q2 of the original model must be significantly higher than for the permutated models. Furthermore, we performed observation risk (ORisk) analysis (Ståhle and Wold 1990) to assess any undue leverage of single observations. ORisk is computed from the difference in residual standard deviation of the predicted variable when the observation is part of the model and when it is not. When multivariate prediction models contain collinear predictor variables, variable importance for projection values (VIP) has been found to be superior to, for example, multiple regression coefficients of individual predictor variables for determining the relative predictive significance of individual constructs (Mehmood et al. 2012; Chong and Jun 2005). However, in OPLS models with only one predictive component, which is the case in this study, the VIP values will be directly linked to the loading weights of the predictor variables on the predictive component. In this special case, the loading weights are equally good indicators of the variables’ relative importance for prediction as VIP values are. Since the loadings also show the nature of the relation between the predictor variable and the dependent variable (i.e., if the relationship is negative or positive), we have chosen to provide those instead of VIP values when depicting the development of relationships between EB and AG over the grades (Figs. 3, 4, 5, and 6). 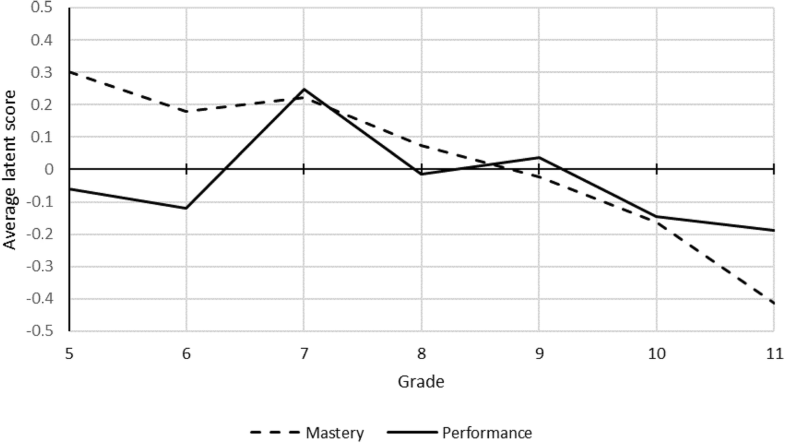 In the cross-sectional data, mastery goals showed a nearly linear drop in students’ average latent scores over grades 5–11 (Fig. 1). The decrease was approximately 0.7 units, from 0.30 to − 0.41, corresponding to an equally large decrease in the 5-point Likert scale. At the transition from primary to lower secondary level, performance goals increased from a low level in grades 5–6 to a peak in grade 7, and then decreased again until grade 11, where performance goals reached the lowest levels of the whole time span. Students’ average latent scores on the EB dimensions were comparably stable over grades 5–11 (Fig. 2). 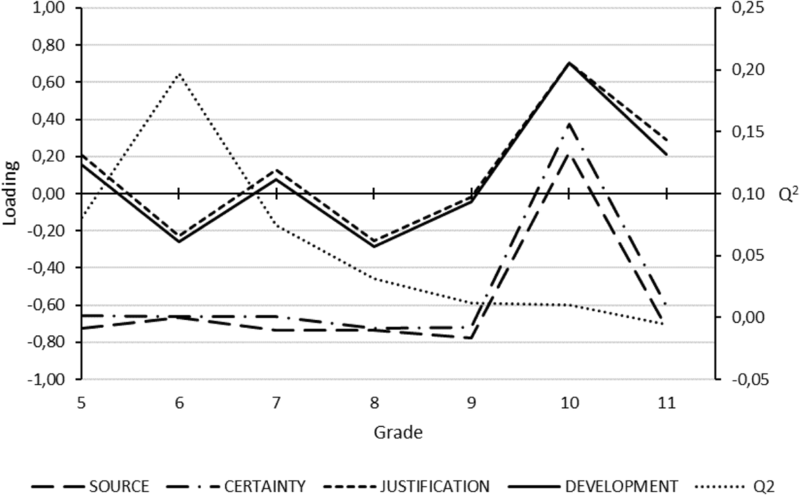 After the transition to grade 10, students’ EB about justification and development of knowledge showed a temporarily increased level of sophistication, after consistently becoming more naïve from grade 6. The certainty and source constructs showed some variability around zero, but there were no significant differences between the grades. Zero-order Pearson correlations over all grades in the cross-sectional study are presented in Table 3. Mastery goals showed significant positive correlations with sophisticated beliefs about the justification (r = .324) and development (r = .309) of knowledge, but were insignificantly or very weakly correlated with source and certainty. Performance goals showed significant negative correlations with sophisticated beliefs about source (r = − .227) and certainty (r = − .203), but non-significant correlations with justification and development. In brief, zero-order correlations implied that students with sophisticated beliefs tended to adopt mastery goals, and students with more naïve beliefs tended to adopt performance goals to a higher extent. The EB dimensions grouped together two and two. Source and certainty showed strong positive correlations with each other (r = .967), but weak to moderate correlations with development and justification. Likewise, justification and development showed strong positive correlations with each other (r = .985). According to CV-ANOVA and response permutation tests, prediction of achievement goals by students’ epistemic beliefs was problematic in some grades. In general, the relationship between EB and performance goals was more difficult to predict than between EB and mastery goals. In the cross-sectional study, all models were acceptable for mastery goals. For performance goals, the models for grades 5–8 proved valid. In the longitudinal study, all models for predicting mastery goals were acceptable according to the response permutation, but the CV-ANOVA indicated that the predictive ability was low for grades 6, 9, and 11. For performance goals in the longitudinal study, only the models for grades 7 and 9 met the criteria. An ORisk of 1 means that there is no difference in residuals of the predictive variable. The largest ORisk value observed in the sample was 1.25, and hence no observation was judged to have undue leverage on the predictions models. Moreover, according to DmodX and Hotellings T2, there were no outliers that deviated from the general student response patterns captured by the models. Justification and development were more important than source and certainty for predicting mastery goals. Over the whole grade span, sophisticated beliefs about justification and development of knowledge were positively associated with mastery goals. This pattern is visible in both the cross-sectional and the longitudinal study (Figs. 3 and 4). 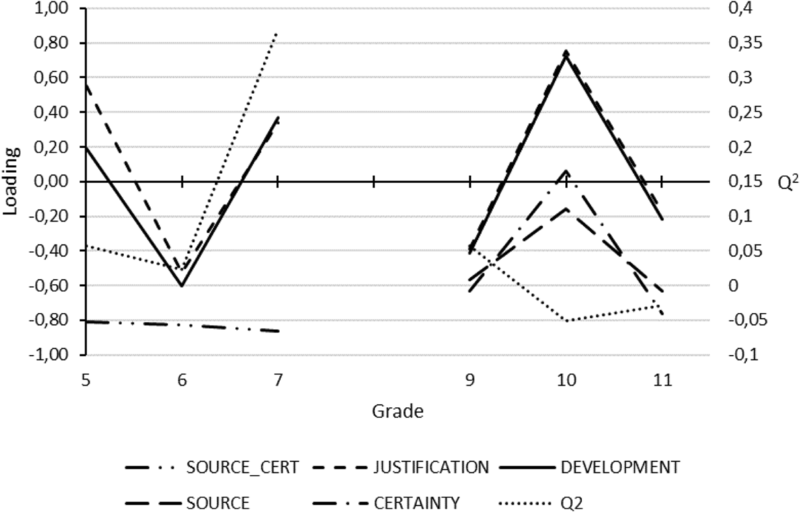 The cross-sectional study indicated that although source and certainty were rather unimportant for prediction of mastery goals in grades 5–9, they increased in importance at the transition to upper secondary level (from grades 9 to 10), approaching the importance of justification and development. 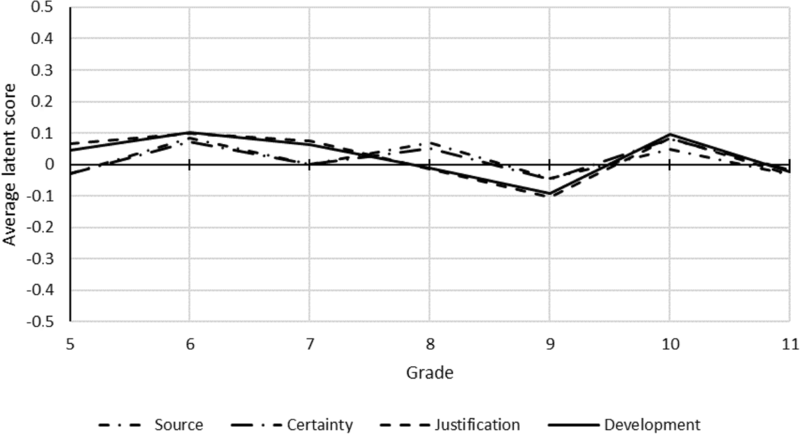 In contrast to models predicting mastery goals, source and certainty were more important than justification and development for predicting performance goals in grades 5–9. 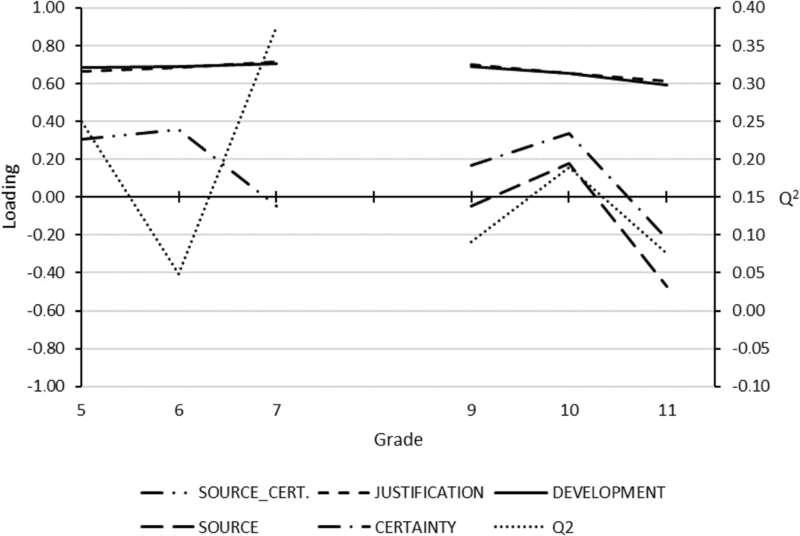 In these grades, sophisticated beliefs about the source and certainty of knowledge were associated with lower levels of performance goals (Figs. 5 and 6). In adjunction to the transition to upper secondary school, all EB constructs became positively associated with performance goal, with justification and development showing higher importance for prediction than source and certainty. In grade 11, the relationship reverted to the pattern in grades 5–9. These trends were similar in the cross-sectional and the longitudinal study. In general, the models predicting master goals showed considerably higher predictive ability (Q2) than the models predicting performance goals. Furthermore, the Q2 for prediction of performance goals decreased from grade 6 to grade 11 in the cross-sectional study. This study’s results show that the relationship between EB and AG is not straightforward. Although naïve beliefs were in general associated with performance goals and sophisticated beliefs with mastery goals, this relationship did not apply for all beliefs and at all grades. For instance, in contrast to DeBacker and Crowson’s proposition (2006), sophisticated beliefs about justification and development were positive predictors of performance goals in several grades in both the cross-sectional and the longitudinal study. This was particularly obvious after the transition to upper secondary school in grade 10, where the predictive importance of justification and development in the performance goal model sharply increased to a substantially positive value. At the same time point, the predictive importance of source and certainty decreased, and in the cross-sectional study changed from a large negative value to a positive value. There were also indications of changed patterns for the prediction of mastery goals at grade 10. Although the low predictive ability in grade 10 warrants caution, these results suggest that the transition to upper secondary school is pivotal for the association between students’ EB and AG. In this study, EB showed stability over the course of the school years, corroborating previous studies (e.g., Bråten and Strømsø 2004; Greene et al. 2016). Although the items measuring students’ EB were situated in the chemistry context, they concerned general aspects of the science of chemistry rather than students’ “practical” epistemic thinking in the chemistry classroom. Hence, our data corroborate the proposition by Muis et al. (2016), that domain general EBs are quite persistent cognitive belief structures. Likewise, the decreasing trend of AG, and in particular mastery goals, is in line with previous research (e.g., Mason et al. 2013; Vedder-Weiss and Fortus 2012; Meece and Miller 2001). This change in students’ motivation over the school years is often attributed to changes in the school environment (Midgley et al. 2001), as it tends to become less supportive and more outcome focused in higher grades (Schunk et al. 2013). In our study, although EB and AG showed different trajectories over the school years, their inter-construct relationship remained relatively stable until the transition to the upper secondary level in Grade 10. While the change in EB-AG correlation structure seemed transient for performance goals, it persisted in Grade 11 for mastery goals. Our data indicate that presence of sophisticated beliefs (in our case, in justification and development) and absence of naïve beliefs (in source and certainty) are necessary for maintaining/developing mastery goals in upper secondary school. Interestingly, it seems that while sophisticated beliefs also became important for maintaining/developing performance goals in grade 10, the absence of naïve beliefs was not important. However, in grade 11, naïve beliefs reclaimed their position as the most important predictors of performance goals. The present study cannot provide an explanation for these patterns. However, we know that the transition to upper secondary school entails large changes in the students’ school environment. Among other things, students change schools and teachers, are grouped into new classes based on choice of study program, and are graded on each course instead of at the end of each semester. Moreover, the amount and complexity of what is to be learned and the level of autonomy in learning is significantly different from lower secondary school for most study programs. These changes in school environment, given the contextual nature of both EB and AG, are likely to influence associations between EB and AG. As our data do not give information on the mechanism behind this influence, more research on the effects of transitions is needed. One observation that supports the importance of the environment’s impact on the goals is the peak in performance goals in grade 7 in the cross-sectional study. At this point in the Swedish school system, the transition to secondary school entails a stronger focus on grading and school performance for most students. The normative aspect may also become emphasized in new constellations, when students have to establish new hierarchies in the classroom and therefore compare their own performance with that of other students’. This implies that the transition can affect, at least temporarily, the way students evaluate and validate their competence. Yet, if this is true, we cannot find a plausible explanation as to why this does not seem to apply to the transition to upper secondary school. Besides fluctuating importance for prediction over grades, the dimensions of EB showed different importance for predicting different AG. 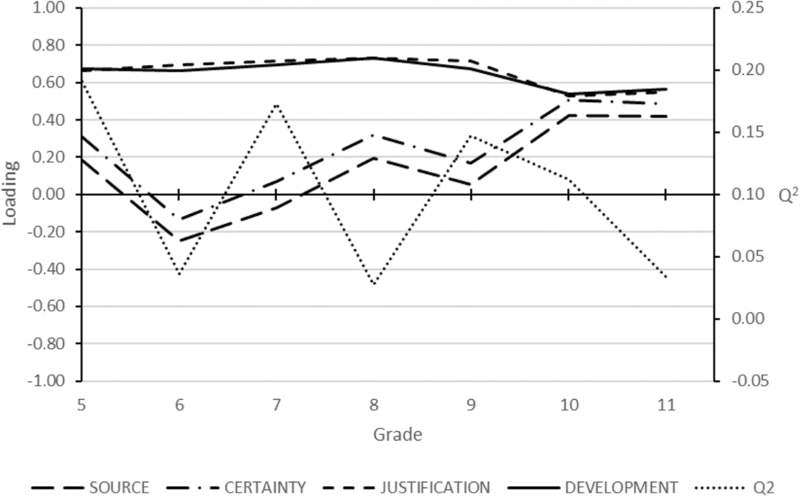 Similar to previous research, sophisticated beliefs about justification and development were positively associated with mastery goals (as in Kizilgunes et al. 2009; Ricco et al. 2010; Chen 2012; Mason et al. 2013), whereas sophisticated beliefs about source and certainty were negatively associated with performance goals (as in Muis and Foy 2010; Ricco et al. 2010). However, the positive association of naïve beliefs about source and certainty with mastery goals found in earlier studies (as in Kizilgunes et al. 2009; Ricco et al. 2010; Chen 2012), was not evident in grades 5–10 in our data. Also, sophisticated beliefs about development and justification only showed a clear positive association with performance goals in grade 10 in our data, while previous research show positive relationship over all investigated grades, that is, grades 6–8 (Ricco et al. 2010; Kizilgunes et al. 2009; Chen and Pajares 2010). Overall, when deviating from earlier findings, our results are in line with the proposition of DeBacker and Crowson (2006) that sophisticated beliefs are associated with mastery goals and naïve beliefs with performance goals. Nevertheless, our results suggest that this proposition is true only for specific combinations of EB and AG. Specifically, for the investigated range of grades, mastery goals seem to be positively related to the sophistication level of justification and development, whereas performance goals seem to be positively related to the naïveté of source and certainty. This pattern corroborates the results of Chen (2012), Kizilgunes et al. (2009), Mason et al. (2013), Muis and Foy (2010), and Ricco et al. (2010). However, we do not see any theoretical reasons as to why beliefs about source and certainty would be more predictive of performance goals than beliefs about justification and development. Instead, we propose that the observed patterns could be explained by differences in the formulation of the EB items. In the instrument used, justification and development are assessed as level of sophistication, that is, items are phrased with a positive polarity with respect to the theoretical naïve-sophisticated continuum. For example, students are asked to what degree they agree with the statement “in chemistry there can be many ways to test your ideas.” Conversely, source and certainty are phrased with a negative polarity, assessing level of naïveté. For instance, students are asked to what degree they agree with the statement “everybody has to believe what scientists say.” Hence, the constructs assess either degree of sophistication or degree of naïveté, respectively, but fail to capture the opposite end of the naïve-sophisticated continuum. For example, students who do not identify themselves with a naïve belief about the source of knowledge do not necessarily thereby identify themselves with a sophisticated belief (see, e.g., Greene and Yu 2014). If the differing relationships between the two pairs of EB constructs and AG seen in our studies are, in fact, an effect of measuring different parts of the naïve-sophisticated continuum, our results may be interpreted as if the level of naïveté generally predicts performance goals and the level of sophistication generally predicts mastery goals, which would be in line with DeBacker and Crowson (2006). This conclusion would in turn entail that the nature of the individual EB dimensions are less important than what part of the naïve-sophisticated continuum the constructs assess, at least when predicting AG. The associations between EB and AG were rather weak in this study. Zero-order correlations were at most around .3, and the predictive ability of EB in OPLS models generally low, with highest Q2 values around .37 for both mastery and performance goals. Furthermore, CV-ANOVA and response permutation testing indicated low validity for models predicting performance goals in grades 9–11. This could indicate that results are spurious and could be different if the study was repeated. Yet, patterns from the cross-sectional study were in essence repeated in the longitudinal study, and ORisk, DmodX, and Hotelling T2 indicated that the models described students’ actual response patterns well. In this study, we set out to deepen the knowledge about how the relationship between students’ EB and AG develops over time by examining the nature and strength of the association in a cross-sectional and a longitudinal study. Our study showed that, in general, sophisticated beliefs about justification and development positively predict mastery goals, and naïve beliefs about source and certainty positively predict performance goals. However, the instruments used in this study cannot fully capture the naïve-sophisticated continuum of the EB dimensions. Hence, our study cannot rule out the possibility that there is a general trend, with sophisticated beliefs positively predicting mastery goals and naïve beliefs positively predicting performance goals. The problem of only capturing parts of the naive-sophisticated continuum applies to most contemporary EB instruments, tapping into either naivety or sophistication in the different dimensions. Thus, researchers aiming at studying the presumed unique predictive patterns of EB dimensions need to design their instruments carefully to measure the full naïve-sophisticated continuum for each dimension. It is beyond the scope of this paper to discuss in depth how this could be achieved. However, we suggest using bi-polar items, with mixed directionality to avoid acquiescence effects, or a balanced mix of naïvely and sophisticatedly poled beliefs within each dimension (Danner et al. 2015). Both the cross-sectional and longitudinal study showed altered patterns for the relationships between EB and mastery goals after the transition to upper secondary school in grade 10. These changes were paralleled by changes in relative importance of EB constructs in the models predicting performance goals, again in both the cross-sectional and longitudinal study. Although the models predicting performance goals showed questionable predictive ability in grades 9–11, we argue that this overall trend indicates that the transition to upper secondary school substantially influences both the strength and nature of the relationship between students EB and AG. As to the exploration of how students thinking about knowledge relates to motivation, our study has deepened the knowledge about their interplay within the epistemic cognition puzzle. Although there is still a long way to go before the puzzle is complete, our study has shown that the interplay is dynamic and context sensitive. We thank Ewa Bergqvist at Umeå University for reviewing drafts of this manuscript. This study was funded by the Swedish Research Council via grant number 721-2013-2180. Student motivation. Epistemological beliefs. The characteristics of the learning environment: Interdependencies and trajectories. Lindfors, M., Winberg, T. M., & Bodin, M. (2017). The role of students’ scientific epistemic beliefs in computer-simulated problem solving. Scandinavian journal of educational research. Winberg, T. M., & Berg, C. A. R. (2007). Students’ cognitive focus during a chemistry laboratory exercise: Effects of a computer-simulated prelab. Journal of Research in Science Teaching, 44(8), 1108-1133. Winberg, T. M., & Hedman, L. (2008). 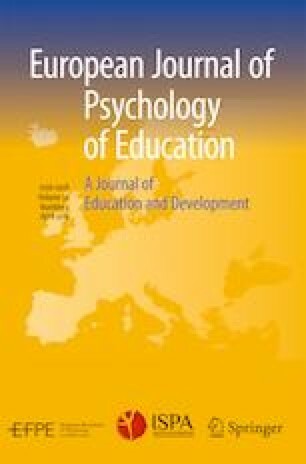 Student attitudes toward learning, level of pre-knowledge and instruction type in a computer-simulation: effects on flow experiences and perceived learning outcomes. Instructional Science, 36, 269-287. Winberg, T. M., Hellgren, J. M., & Palm, T. (2014). Stimulating positive emotional experiences in mathematics learning: influence of situational and personal factors. European Journal of Psychology of Education, 29(4), 673-691. Students’ achievement goals: cultural influences, relation to epistemic beliefs, and relation to students’ perceptions of classroom environment. Students’ epistemic cognition, its influence on their learning, and the interplay between students’ epistemic cognition and the surrounding epistemic climate. Midgley, C., Maehr, M. L., Hruda, L. Z., Anderman, E., Anderman, L., Freeman, K. E., et al. (2000). Manual for the patterns of adaptive learning Scales. http://www.umich.edu/~pals/PALS%202000_V13Word97.pdf. Accessed September 15. 2016.